Lady Pirate Cassie Carlyle calls for doubles partner Olivia Hewston to take a serve during state tournament play Friday morning in Missoula. Polson’s Marlee Congdon stretches for the ball during her match with Columbia Falls netter Emily Getts, who managed the win 2-6, 6-0, 6-0. Olivia Hewston serves during her doubles match with partner Cassie Carlyle against Billings Central’s Meg Fitzgerald and Molly Putnam Friday morning. The Polson duo eventually lost the match 6-7(4), 6-3, 6-3 to end their tournament run. Cassie Carlyle and Olivia Hewston hustle to change places. 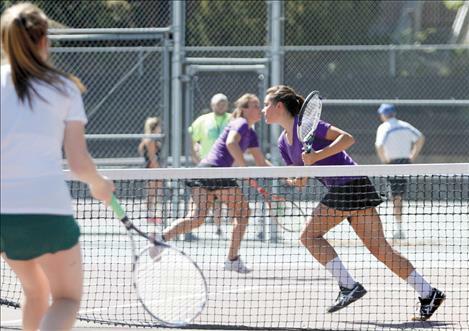 After the Lady Pirates added their ninth straight divisional tennis title to the Polson coffers — and the Pirates nearly claimed the boys’ title, too — a solid showing at the Class A State tennis tournament on the University of Montana courts in Missoula capped off what veteran head coach Bob Hislop said was a successful season overall for his young team. “They did a nice job,” he said. 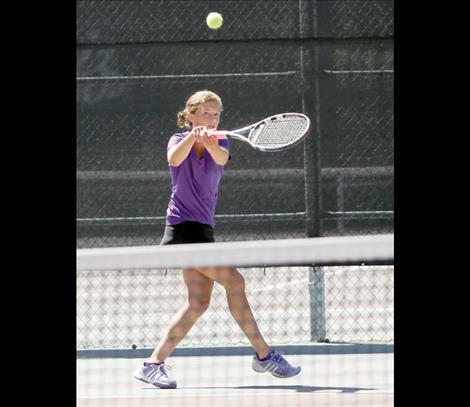 The competition this round was as tough as any Hislop’s seen in 24 years attending the state tourney with the Polson tennis team. 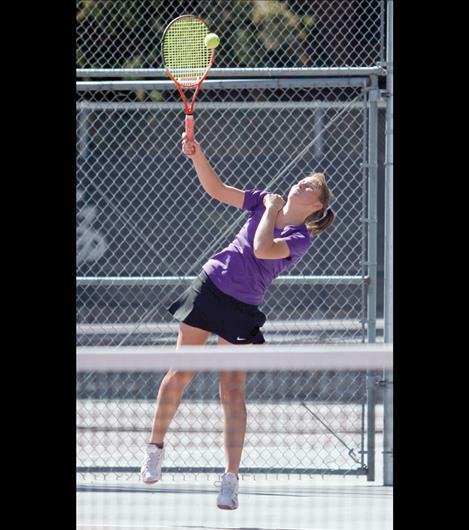 The Pirates didn’t have any boys’ singles players at state, but girls’ singles players Mollie Lemm and Marlee Congdon faced a field Hislop estimated was at least eight deep with solid opponents. Congdon was a standout for Polson, climbing to sixth place and earning All-State recognition. “For Marlee to do what she did was a very cool thing,” Hislop said. Leading the Lady Pirate attack, Congdon quickly stopped Billings Central’s Megan O’Leary 6-1, 6-2 in her opening match Thursday but wasn’t able to handle Park’s Emillee Coleman with the same ease, dropping her second match 6-1,6-3. Congdon moved on to the loser’s bracket to face another Park athlete, Shelly Ouelette, and regained her momentum to win 6-0, 6-2. Congdon next schooled Paula Fernandez of Libby 6-2, 6-1, and moved on to play Columbia Falls’ Emily Getts on Friday. Despite a strong effort by Congdon, Getts picked up the win, 2-6, 6-0, 6-0. 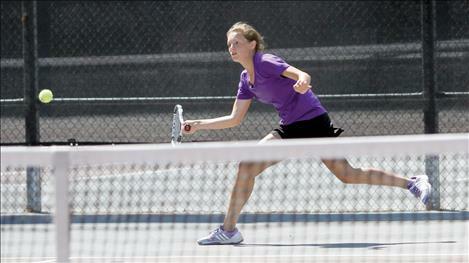 In the fifth-place match, Amber Wissenbach of Corvallis managed to squeak by Congdon 7-5, 7-5. Polson’s other singles entry, Lemm, drew a tough opponent in eventual champion Barclay Fagg of Billings Central for her first match and “played her really nice,” Hislop noted. Fagg won 6-1, 6-0, and Lemm was eliminated in her second match against Adrienne Southam of Beaverhead. In girls’ doubles action, Olivia Hewston and Cassie Carlyle lost their first match 7-5, 6-4 to Dakota Vaccaro and Miriam Montgomery of Corvallis, but the Lady Pirates made short work of Fergus’s Ciara Backer/Beth Olson in their next match, 6-0, 6-0. Whitefish’s Cailyn Ross and Hannah Madsen were next in the Polson’s duo’s sights, and the Lady Bulldogs fell 7-5, 6-1, securing the Polson team’s spot on Friday’s bracket. There they would face the Billings Central team of Meg Fitzgerald and Molly Putnam, who had just beaten Polson’s Taelor Rost and Shawna Lenz. The Billings pair eventually eliminated Hewston/Carlyle 6-7(4), 6-3, 6-3. Rost and Lenz took on Jennifer Womack and Nicole Thompson of Beaverhead County in their opening match, picking up a 6-2, 7-5 win before losing a tough second-round match to the Billings Central pair of Megan Pritchard and Sarina Aamold, 6-4, 6-2. 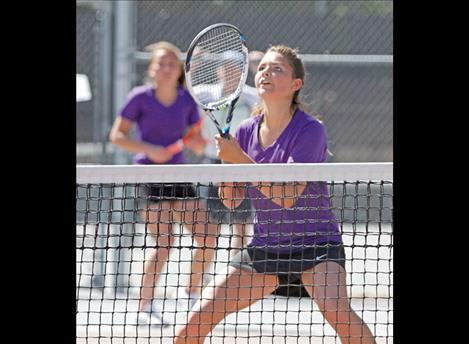 The Lady Pirate pair battled hard but couldn’t top Billings Central’s Fitzgerald/Putnam, falling 7-5, 3-6, 7-6 (6). Boys doubles partners Cadis Chowning and Tommy Mercer shut down Havre’s Wyatt Lindbloom and Nate Korb 6-3, 2-6, 6-4 in the opener, but drew a tough matchup in Billings Central’s powerhouse duo John Knisely and Harrison Fagg, the eventual doubles champions, in the next round, falling 6-1, 6-1. Moving on to the loser’s bracket, the Polson pair fought hard but eventually lost to Hamilton’s Josh Heath and Bridger Palin 6-3, 3-6, 6-3. Colin Kenney and Quaid Harlan also won their first-round match over Fergus’s McKye McCarthy and Trip Krouse, 6-3, 6-3, but couldn’t keep up their momentum in the next round against Jory Opp and Dennis Berg of Dawson County, dropping the match 6-0, 6-0. In the loser-out match, the Polson netters fell 6-1, 6-3 to Stevi’s Colton Belcourt and Curtis Liston. The Polson girls finished in sixth place, just one point behind fifth-place Columbia Falls, while the boys ended in a three-way tie for ninth with Park and Anaconda. “It was a very successful weekend,” Hislop said. As the Lady Pirates will lose just one senior, Rost, to graduation, Hislop says the team has a lot to look forward to next season. “We’ll have a lot of experience next year with five girls coming back,” he said. The Pirates will lose lone senior Tommy Mercer to graduation, and teammate Tim Russell is moving out of the area, but Hislop said there’s some solid potential among the younger players. “We feel like we’ve got a nice nucleus back, but we have some work to do,” Hislop said. Jeff Miller, Havre, def. Alex Raymond, Hamilton, 6-4, 6-3. Final - Pekoc def. Miller, 6-2, 6-3. Third/fourth - Briones def. Raymond, 6-1, 6-0. Bill. Cent., def. Jory Opp/Dennis Berg, Glendive, 7-5, 6-2. Final - Knisely/Fagg def. Pankratz/Newbury, 6-1, 1-6, 6-0. Final - Fagg def. McHugh, 2-6, 6-3, 7-5. Third/fourth - Coleman def. Getts, 6-3, 6-3. Staiger, Glendive, def. Lindsay Lane/Lindzi Printz, Livingston, 6-3, 6-4. Final - Kellley/Woods def. Crockett/Straiger, 6-2, 6-0. Third/fourth - Pritchard/Aamold def. Lane/Printz 6-2, 7-5. Albert/Savannah Green, Hardin, 6-4, 1-6, 6-4.